I made some very special keto cupcakes in honor of the diabetes community. 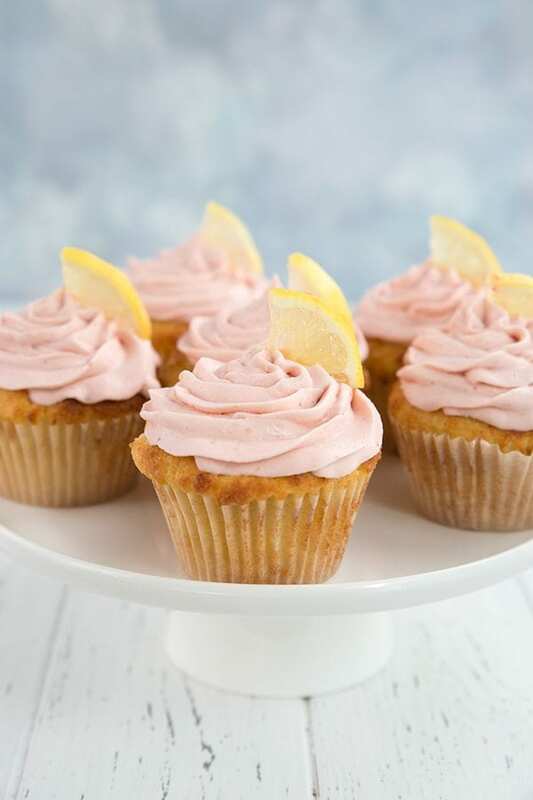 These tangy sweet strawberry lemonade cupcakes are perfect for your low carb parties. This post is sponsored by Bob’s Red Mill. So I find myself in an interesting position lately of becoming something of a spokesperson for the keto diabetes community. It’s interesting how it has developed and grown. As so many of you are aware, I’ve never done the keto diet for weight loss. I came to the low carb way of life because it seemed like the best way to manage my blood sugar and stay off insulin. My “official” diagnosis is pre-diabetes but I consider myself a Type 2 diabetic. What is pre-diabetes if not a part of the diabetes spectrum? I just happened to catch mine early enough to take action and keep it from getting worse. Lucky me. Lucky me is right. Because I do actually feel lucky. Lucky to have found this amazing (and delicious) lifestyle, lucky to have the chance to become healthier, lucky to have found a way to express myself through cooking and baking, and truly lucky to have the chance to show others the way. To show others that it’s not as hard as it seems and that it can truly be enjoyable. To show others that the best, perhaps the ONLY way, to truly manage diabetes is with a low carb diet. So to that end, I am thrilled to tell you that I will be attending and speaking at The Blue Ball in Sioux Falls, SD on April 7th. 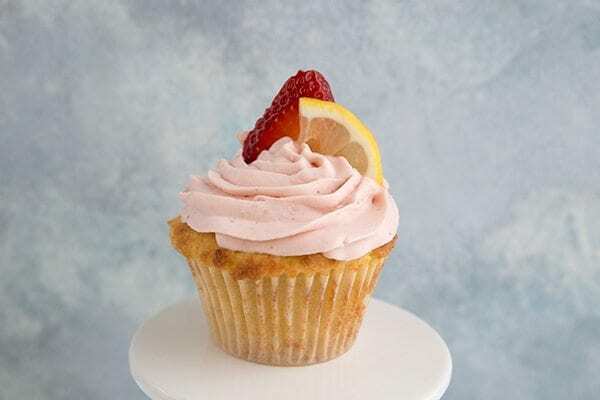 And the ball itself will feature TWO of my low carb desserts, including these delicious Strawberry Lemonade Cupcakes, which I developed specifically for this event. And as over 300 people will be attending The Blue Ball, my friend’s at Bob’s Red Mill generously donated the almond flour for these desserts. Bob’s has always taken their mission of better nutrition very seriously. 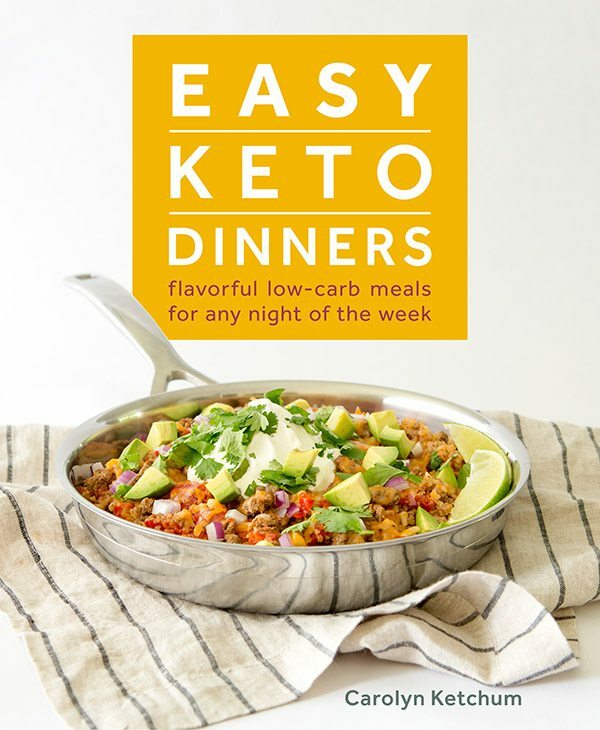 They offer some of the best low carb products out there and it makes living with diabetes a whole lot easer. Swerve Sweetener also donated all of the sweetener for the desserts. I am honoured to work with both of these companies. Blue is the colour of Diabetes Awareness, and The Blue Ball is a fundraising event for LetMeBe83.org. Let Me Be 83 is an organization dedicated to helping people with type 1 and type 2 diabetes. We respectfully reject the ADA guidelines given to newly diagnosed families to count unlimited carbohydrates and try to match their break down with a corresponding dose of insulin. We fundamentally believe that if you have an illness whereby a person can’t break down carbohydrates, the most logical method to manage this disease would be to significantly decrease their carbohydrate consumption. Insulin is an unpredictable medication. People with diabetes are safer and are less likely to have a dangerously low blood sugar with less insulin in their system. Limiting carbohydrates also reduces the frequency and intensity of elevated blood sugars which lead to life-long complications. Utilizing a low carbohydrate diet and the proper insulins, a person with diabetes can achieve normal blood sugars. The Blue Ball is an advocacy and awareness fundraiser to raise money for Let Me Be 83. The funds raised this evening will be used to construct patient Success Kits. 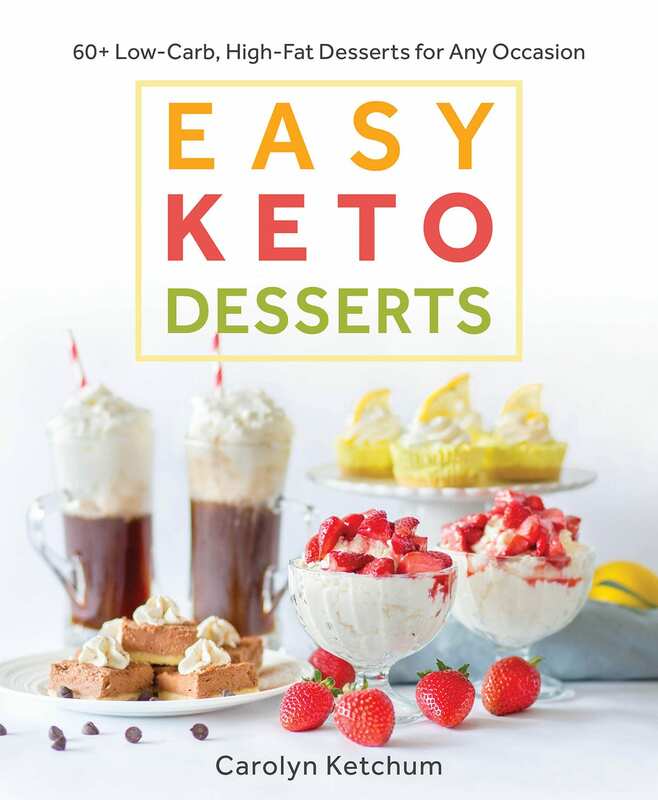 These comprehensive kits will contain a book called Diabetes Solution, by Dr. Richard K Bernstein, a low-carb keto cookbook by Carolyn Ketchum, a shopping list, a blood sugar journal, an educational booklet, and a fanny pack to transport diabetes supplies. Our goal is to send newly diagnosed families out of the door of the hospital with everything they need to successfully manage their disease. 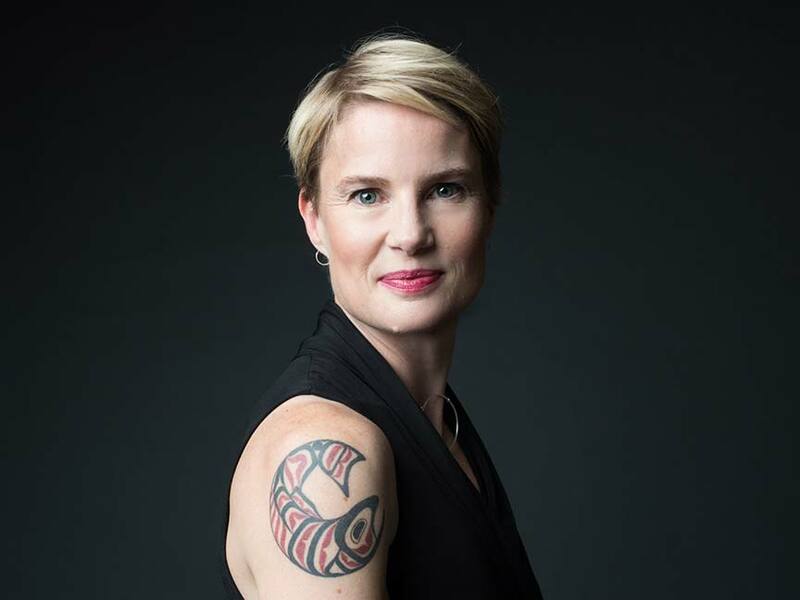 The founder of Let Me Be 83, Bethany McKenzie and her husband Matt have a 10-year-old son, River, with type 1 diabetes. For 3.5 years they faithfully followed the ADA guidelines to count carbohydrates and dose insulin. They meticulously measured carbs and precisely dosed insulin, yet this still resulted in roller coaster blood sugars and lackluster health for their son. One evening after hitting rock bottom with unpredictable blood sugars, they drastically changed their son’s (and whole family’s diet.) The joy and relief they felt by finally being able to achieve normal blood sugars propelled them to start a foundation so that every family could enjoy this level of health and happiness. Their son is growing and thriving in both academics and athletics, and he inspires other families to gain control of their diabetes. I made some very special keto cupcakes in honor of the diabetes community. 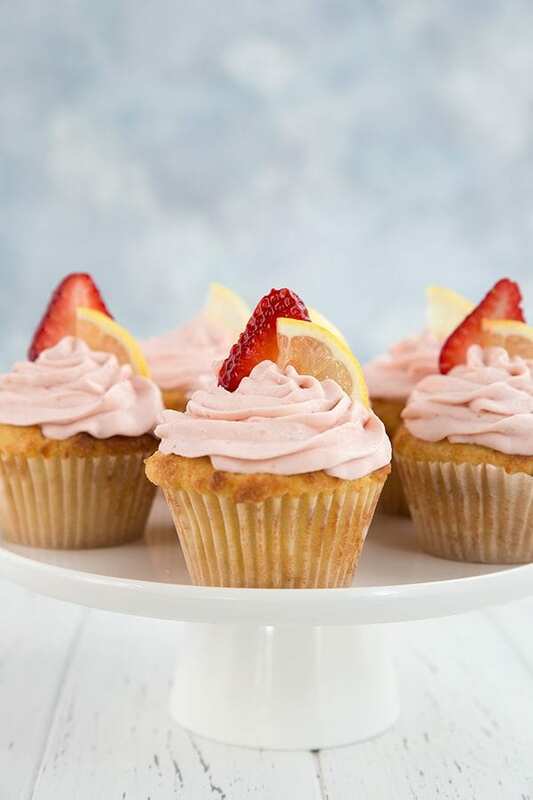 These tangy sweet strawberry lemonade cupcakes are perfect for your low carb parties. Preheat the oven to 350F and line a muffin tin with parchment or silicone liners. 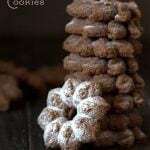 In a large bowl, whisk together the almond flour, sweetener, baking powder, and salt. Add the eggs, melted butter, lemon zest, lemon juice, lemon extract, and water and stir until well combined. Add more water if batter is very thick. Divide among the prepared muffin cups and smooth the tops. Bake 25 to 30 minutes, until light golden brown and set to the touch. Remove and let cool completely. In a blender or food processor, puree the strawberries and lemon juice together. Set aside. Beat the cream cheese and butter together until smooth. Beat in ½ cup of the powdered sweetener, then beat in the strawberry puree until smooth. In another bowl, beat the whipping cream with the remaining 2 tbsp of powdered sweetener until it holds stiff peaks. 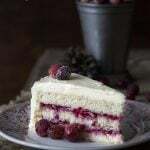 Gently fold the cream cheese mixture and the whipped cream together until no streaks remains. Pipe on to cooled cupcakes and refrigerated at least 1 hour to set. Thank you so much for this recipe. I plan to make it tonight. I have commented before and told you about my 19 yo daughter who hasn’t Type 1 diabetes. 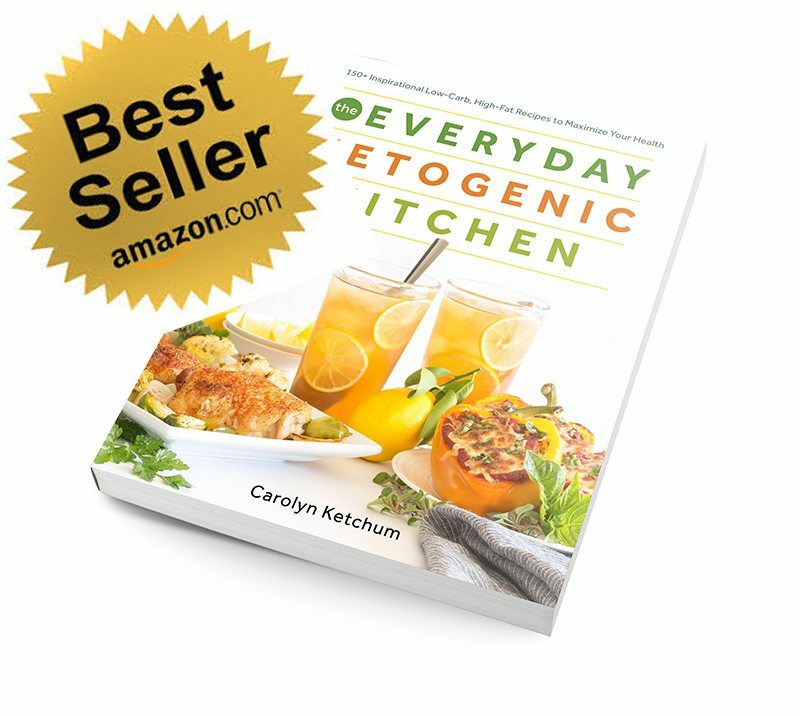 She has my first copy of your Everyday Ketogenic Cookbook and cooks almost all of her meals from it. She is in college and is busy and stressed but has still managed to bring down her A1C from 9.0 to 7.4 with her last visit to her Endo. Her doctor asked how she did that in 3 months and she told him she is cooking at home. He was very impressed that just cooking at home could make a difference. Her plan isn’t to let him know her secret with her next visit and her next decreased A1C. 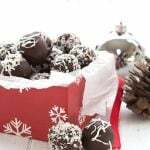 In all truth I believe it wasn’t your German Chocolate Truffles that changed her mind about low carb eating, LOL. Thanks again and I am looking forward to the release of your next cookbook since I have already ordered me one and will Moreno than likely end up buying one for Paige also. Hey Carolyn. Can’t wait to get your new book – – status says it will be here next week. WEEEE ! Quick question: Do these store well in the fridge or what should you do to preserve them for freshness? They can be in the fridge for up to 5 days. You can always make a half batch, too! They lasted a week in my fridge. I don’t know how because we sure ate a lot of them, and I sold them for the music boosters at the high school musical! I made many of them miniature, topped with the frosting and a raspberry. Love that you put these flavors in a cupcake! Love the sweet strawberry with the tart lemon! So much fruity goodness! Yum! So light and refreshing for spring! My fav drink in cupcake form! 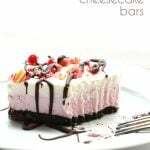 These may be on my Easter menu! Thank you for what you do for the diabetes community – my daughter is Type 1 and she does much better with her sugars when she eats low carb. I try not to restrict her though, so she doesn’t eat low carb all the time. It really helps to have delicious recipes to try to help her. Thank you, Carolyn. Sounds delicious. I was just wondering what the nutrition count would be without the frosting. Thank you for your inspiration! Do you use swerve granular except where noted to use powder? These are *amazing*! I just made a batch to bring to the in-laws for Easter dinner, and since our batch made 13, my husband and I split one, once frosted, to try…so good! I think next time I will convert this to a cake, thank you for the recipe! Hi! 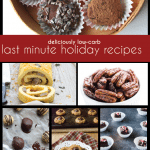 Thanks for all your great recipes-you are my go-to for my low carb life style cooking. Once again, this is a great recipe. I did find my little grandkids (5 & 2) didn’t care for the tartness, but the adults thought they were great-and they don’t eat low carb; sugar & wheat free. That’s a real compliment. For other people, just some extra info. I have found that my cupcake papers are a bit smaller than my cupcake pan, so the batter goes over the edges a bit, making it hard to remove them. I am thinking of getting some of the tall tulip style papers for next time. Funny, my kids found them a bit tart too. But my adult friends loved them. Good point about the papers…I use silicone liners. Do you think I could sub vegan butter sub for this? My daughter who has celiac, addisons disease (which actually is low blood sugar, but her brother is type1 and celiac, so desserts are still low sugar here) and dairy allergy….she just diagnosed with hAddisons, and I don’t want to waste ingredients. thanks. I am not sure, to be honest. I think you’re okay in the cake part itself, using whatever oil you want. 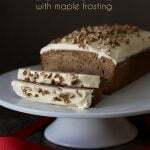 I haven’t tried to make this frosting dairy-free. Kite Hill is the best DF cream cheese option. I think you may have to play with it to make it have the right consistency but it’s worth a shot. Just a quick question about these delicious looking cupcakes. Can they be held at room temperature for an extended amount of time (12-24 hrs)? I need something that can be left out at a girl scout camp with no danger. These seem perfect but I wasn’t sure about the cream in the frosting. Thanks for any info, and have fun at the Ball! The frosting could be a little runny if left out that long. I have to be honest! Thanks for the response. I may just try to make a different frosting and see what happens. Dear Carolyn Thank you for all your wonderful recipes. 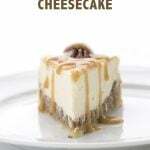 I have made the peanut butter cheesecake and it was a huge hit. Next I made the carrot cake cheesecake and took to Easter Dinner. Another hit. I am a type 1, my husband is a type 2 diabetic and we love having special treats, thanks to you. Five minutes AFTER putting these in the oven I remembered the butter in the microwave. Too far along to try to mix it in. Ugh! Hopefully they turn out ok, so much almond flour! On the plus side, they smell amazing. Oh wow. Hope they do too! Hi Carolyn. I am allergic to almond flour. 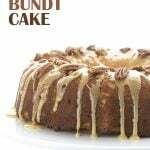 Do you think I could substitute coconut flour for this recipe? Can’t wait to make these today! What do you use for whipped cream? Do you just whip cream? 😂 If so, is the 1/2 cup before or after whipping? You do whip the cream…and you measure it as a liquid first, which is why it’s listed as “whipping cream” (that signals that it’s still the liquid cream, as opposed to saying “whipped cream”). Hope that makes sense! These are absolutely delicious!!!! For some reason when I enter the recipe in my lose it app it says the net carb is 21.5 carbs a serving!! Help! Why is that?? These are so good too! Because it’s conunting the erythritol, which has no impact on blood sugar so should not be counted. I can’t wait to make these!! Can they be made as mini cupcakes and if so, how long should they bake? I am sure they can but I have no idea how long since I didn’t make them that way. 1. Do you think this recipe could work as a cake (for a poke style cake)? I have all the ingredients, and your poke style cake recipes all have something I don’t have on han or usually cook with, like whey powder. 2. 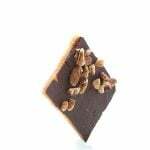 Have you tried Sola sweetener yet? If so, wondering your take, as you do a lot of baking. The local large grocery chain has been carrying it as one of their special “Primo Picks”. I use Swerve, but don’t care for the mouth cooling. And I always have an aftertaste with stevias so I’m kind of like a Low Carb Sweetener Goldilocks, haha. Just made these, and once again and as always, your recipe was spot-on and produced delicious results. 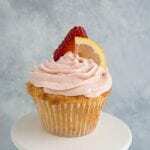 The cupcakes were light and moist, with just enough lemon flavor to brighten them up. I was baking them to accommodate not only myself but also a guest who must eat gluten-free and dairy-free, so I had to use oil instead of butter and made an alternate strawberry topping. 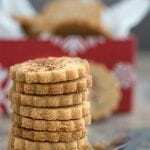 Still, my non-keto taste-testers all agreed they were terrific! Thank you! 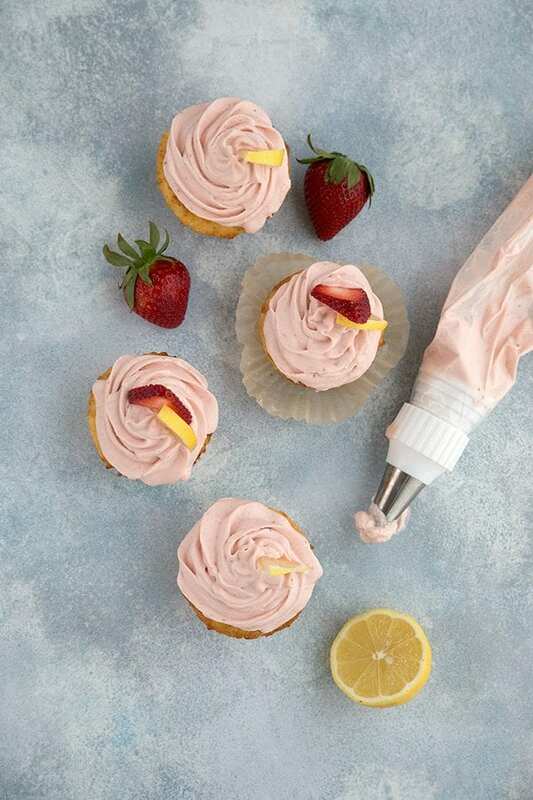 Have you ever swapped the lemon for lime and make a strawberry margarita cupcake? Just made these today and I am in heaven!! I didn’t have lemon extract so subbed in vanilla. But it still has a wonderfully lemony flavor from the juice!! Such a wonderful, moist texture!! 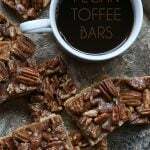 Can’t wait to make them for my keto friends!!! Thank you, Carolyn!! You’re amazing!!! Just made them. All I can say is YUM! I needed something sweet, thank you. I just made them and brought them to a dinner. They were amazing! 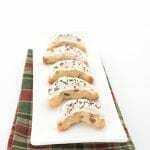 I love to have bake lemon goodies that have a true tartness both from lemon rind and juice. I just had one with my coffee this morning. Great recipe, Carolyn!